Direct stream from server - Eagle Camera. Eagle-TV - videos. 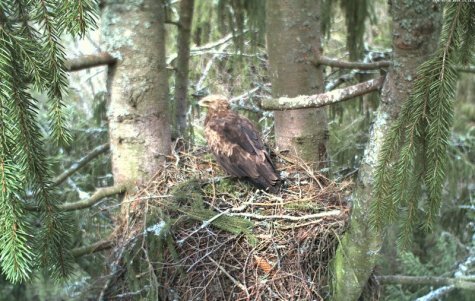 The Lesser Spotted Eagle is the most numerous eagle in both Europe and Estonia. Of all our eagles, the Lesser Spotted Eagle is the only one who has adjusted to the human cultural environment, but he still requires uncut forests for nesting and mowed meadows for food. The older birds' plumage is various shades of brown; young birds are more or less covered with light spots with legs feathered to the toes. Greater- and Lesser Spotted Eagles are similar in appearance. As a rule the Greater Spotted Eagle is darker, larger, and more stocky. Wingspans run from 130 to 180 centimeters. The fact that the two species are able to mate with one another and produce hybrids which may also mate with one another, makes it even more difficult to tell them apart.